It also carries news of the Red Bull Rookies and the Spanish CEV Repsol championship, as well as featuring dedicated updates on the MotoGP™ activities of the Racing Steps Foundation – a not for profit organisation that helps bring young British talent into the sport and which currently backs John McPhee. 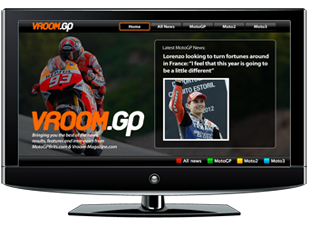 Vroom.GP has been developed using OnScreen Publisher – a publishing system from OnScreen Publishing Ltd designed for delivering multi-screen applications to smart TVs, HbbTV, tablets and mobiles. ScreenConnect manages the technical differences between platforms to allow the audience for connected TV to be served from a single system. The system allows connected TV applications to be deployed across multiple platforms as a single project, reducing cost, time to market and on going management effort. Applications can be developed and deployed quickly and to be easily modified after launch. This is essential in a new area of business as requirements can change rapidly as experience is gained and opportunities identified. OnScreen Publisher can be integrated with existing asset, content and transaction management systems to allow new outlets to be served with a minimum of disruption to existing systems and workflows. 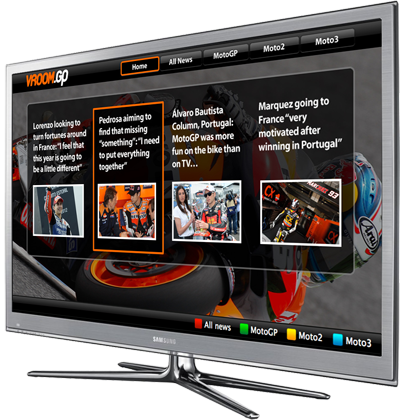 This application demonstrates the integration between ScreenConnect and WordPress, allowing Vroom Magazine to expand their reach to connected TVs, using an application optimised for TV delivery. OnScreen Publisher had been designed to work with player applications for all existing connected TV platforms, including TV manufacturers’ portals and HbbTV, and to be adapted to accommodate new platforms as they emerge, future-proofing investment both in the system itself and the design of services. Published by Vroom Media Ltd.